Does your products need to put into humidity and harsh environment? JFWT is special production of Class X2 MKP series for such environment and provides interference suppression with VDE, ENEC and UL approvals. 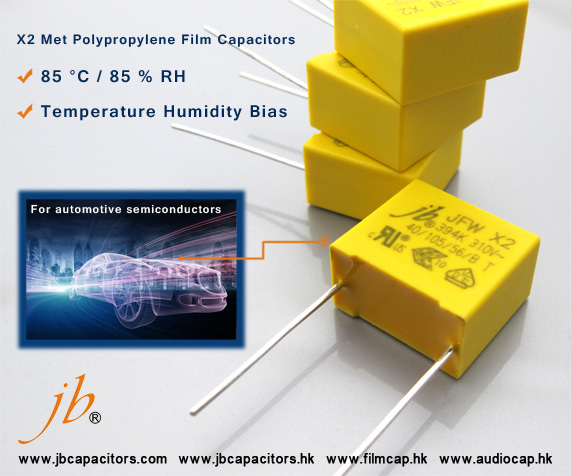 High stability of capacitance under severe ambient condition, high temperature and high humidity. 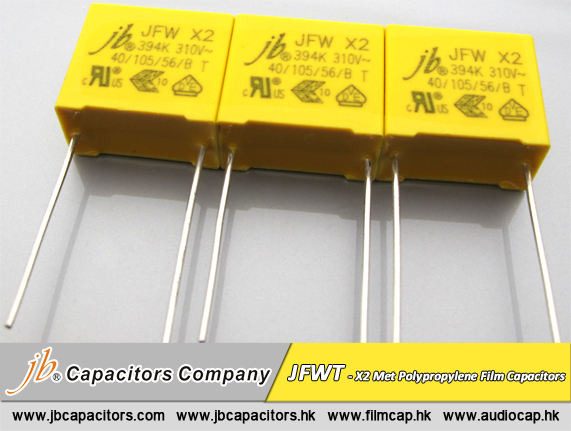 JFWT use for capacitive divider power supply. Such as power meter, LED driver, and other sever ambient condition applications. 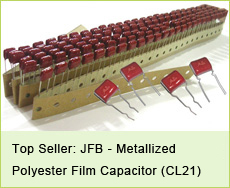 If you are looking for this type capacitor, please contact us, let we quote a best price for you! Class X2 rated capacitors, such as the JFWT 85/85 THB Series are required to achieve a stable performance during operational life while meeting safety requirements. jb capacitors company recognized the challenges and researched materials that would produce more robust parts for harsh environments conditions. 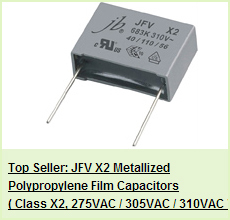 Due to process improvement, JFWT 310VAC class X2 rated film capacitors are ideal for harsh environments 85°C and high humidity conditions 85%, offer self-healing properties, and a high stability of capacitance value. 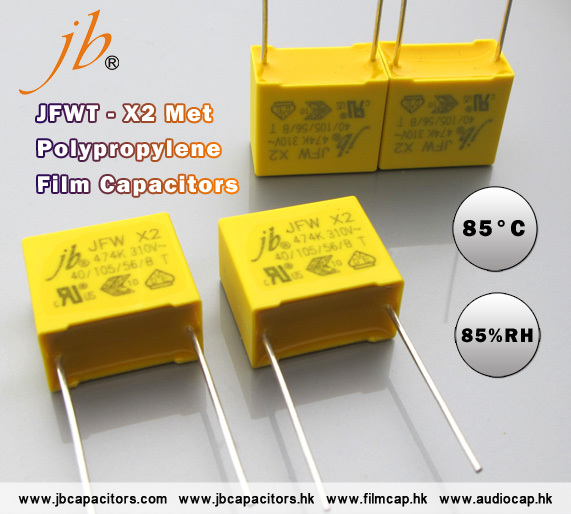 The JFWT class X2 series capacitors are constructed with metallized polypropylene (MKP), wound film technology, a plastic case Flame retardant epoxy resin sealed(compliance with UL 94V-0),safety agency approved, ammo tape pack, cut leads, long leads are available. 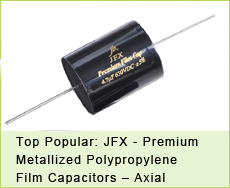 JFWT auto grade film capacitors are used for high stability grade applications in severe ambient conditions, jb JFWT class X2 EMI/RFI metallized polypropylene film capacitors provide robust, across-the-line filtering in automotive, industrial, energy meters and capacitive power supplies applications. X2 Met Polypropylene Film Capacitor - Temperature Humidity Bias (THB) Series ideal for products that must operate out of doors or in other harsh environments. 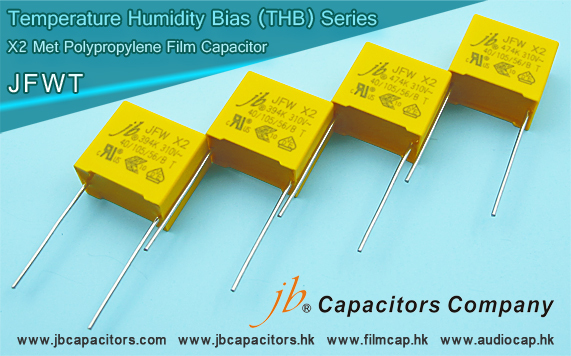 jb Capacitor Company THB Class X2 capacitors - JFWT deliver high performance with outstanding operating environmental range. For automotive semiconductors such as microcontrollers, HIC, and other control automotive electronics. For capacitive divider power supply such as power meter, LED driver, and other sever ambient condition applications.